Western Tatras are the biggest mountain range in Tatra National Park - they cover about 400 km² which is almost a half of all Tatra mountains surface. Western Tatras are lower than High Tatras and definitely less popular. There are also fewer lakes in Western range. The biggest lake in Western Tatras is Veľké Roháčske pleso lake (in Poland it is Smreczynski Staw). However, in the Western range, there are some of the best Tatra National Park trails. Western Tatra peaks are round and have a domed shape (except for Giewont and Roháče peaks). The majority of Western range belongs to Slovakia. There are great hiking trails in Polish Tatras too, but it is Slovakia which offers the biggest choice of trails. I think the region of Slovak Tatras is one of the best places to visit in Europe in summer. In wintertime, the trails are closed. So, let's have a look at some of the best places to visit in Tatra mountains in Slovakia. Sivý vrch reaches 1805 metres and is a perfect option for a whole day hike. The circular route shown below takes about 8-9 hours to hike. However, there is no mountain hut on this route, so it is necessary to take plenty of water and snacks. The trailhead is in Zuberec village. If we leave our car in the village center we start walking on the red trail. Soon there is a trail fork and we change into a yellow path. The trail quickly enters into the forest and gets a bit steep, but the hike is pleasurable. After a few hours, we enter into mountain alps covered with dwarf mountain pine. The landscape gets more interesting with every minute. Vegetation changes gradually as each level of elevation gives quite a different environment. Temperature drops and the greenhouse effect is much less possible on the steep ground. This is one of the very interesting things about mountains that while we hike to the peak we see how plants and trees change based on height. In about 4 hours we get to Sedlo Pálenica Pass (1573 metres) where the trails diverge. It is a nice place to have a break and enjoy the scenic Western Tatra view. From Sedlo Pálenica we follow red trail. It is very pleasant walk and we get to admire breathtaking scenery of Slovak Western Tatras. After about 40 minutes when we get close to Sivý vrch peak the trail gets stony and there are chains for extra protection. A little bit of climbing is necessary, but it is not difficult and even hiking beginners will pass this point without any issues. When we get to Sivý vrch summit we are welcomed by spectacular panorama. All our effort is rewarded now! After we soak in the landscape and gather our energy, we climb down on red trail. The first part (about 1 hour) is still scenic and nice to take memorable photos. Then the path enters into a forest. In about 1.5 hour we get to asphalt road where we turn right onto green trail. Getting to Zuberec villages takes 1 hour. If you would like to stay in Zuberec and prefer peaceful accommodation, you might want to choose Penzion Micik. We truly like this place - the rooms are nice and clean, the kitchen is fully equipped and the location is fantastic. Penzion Micik is located in a quiet area, close to the forest. Here is another route to Sivý vrch mountain, but this one includes mountain shelter Chata pod Náružím (1403 metres). It is one of the best hiking trails in Slovakia. If you feel this hike might be too long for one day, or you are planning to hike with kids, then staying over in this mountain hut might be a good idea. As we can see, the hike takes about 9 hours, but if it is divided into 2 days, the first part would last about 6 hours. On the above map, we can see that there is a yellow parallel trail, but it leads in the forest and there is no mountain view besides the trees. The option given here is much more picturesque 🙂. Trailhead is in Jalovec village. We can drive on an asphalt road which is the yellow trail and then leave our car at the trail fork Bobrovecká Vápenica (748 metres). We start hiking on the blue trail. After 1 hour the trail merges with the green-marked path. After a while pass a war bunker and continue hiking on the blue/green trail for the next 15 minutes. We get to rest stop Pod Babkami (1243 metres). Great place for a break - we can enjoy our snack on a bench and admire the beautiful mountain landscape. From now on we will continue our hike to Sivý vrch summit on the green trail. Getting to the mountain top takes about 3 hours. The scenic path leads through vast mountain alps. After we reach Sivý vrch mountain top it is time to descend the same way. Some hikers do their best to never climb down the same path, but sometimes it is worth it - this trail is amazing!. We get to Sedlo Predovratie Pass (1565 metres) in 1 hour. We change the trail and start descending on the blue-marked path leading to Chata pod Náružím mountain hut. Chata pod Náružím mountain shelter offers basic services. There are only 30 beds available (divided into 3 rooms). We need to bring our own sleeping bags because there are only blankets available. There is also no restaurant in the shelter - we need to bring our own food. However, we can use the kitchen and cooking utensils. It is best to book our accommodation in this mountain cottage, especially if we plan to hike there on weekdays. Phone number: +42 191 116 36 70. Walking down from mountain shelter to Jalovec village takes 2 hours if we keep on hiking the blue trail. The path is still great and offers plenty of opportunities to take lovely photos. If we want to make our descend a bit longer, we can take on the green trail (trail fork Nad kameňolomom 1053 metres) and after 1.5 hours change into the yellow path. We will arrive at the exact same point where we started our trip. If you would like to stay close to this beautiful trail in Western Tatras, you might want to consider Bobrovec village. Peaceful and quiet, ideal for people looking for getaways close to hiking trails. Salatín peak reaches 2048 metres and is one of our favorite Tatra National Park trails. The same as in the trail recommended above, this one also does not include any mountain hut, so we need to carry our food and water ourselves. We decided to hike the while circular trail, but I need to admit it was physically demanding. We start hiking from Pod Spálenou parking lot (1045 metres) on the blue trail. For the first half an hour the path leads us in the forest, but soon we get to admire the emerging view of Tatra mountains. The big advantage of this trail is that it is not so crowded compared to trails in Polish Western Tatras. Getting from the parking lot to Brestová mountain (1934 metres) takes about 3 hours. The path gets steep at some points, but it is a very enjoyable walk. Brestová mountain top is flat and wide, a perfect place for a picnic. After our break we continue hiking on the red trail towards Salatín peak. Getting to this mountain top take about 50 minutes. The path is very interesting to hike and the view rewards all the effort. When we reach Salatín mountain top, we continue walking on the red trail towards Baníkovské sedlo Pass (2040 metres). It takes 2 hours to get there. When we reach the trail fork, we need to change into yellow/green trail descending to Pod Hrubou kopou (1582 metres). We keep on hiking on the yellow trail which soon merges with the blue-marked path. In about 1 hour we get to another trail fork Adamcuľa (1183 metres) where we choose red trail leading in the forest. After half an hour we are very close to Pod Spálenou parking lot. We change into the green trail and in 15 minutes we arrive at our trailhead. Travelers who want to make their hike shorter can use chair lift which takes people from Pod Spálenou to Salatínska Dolina Valley (1467 metres). A one-way ride costs 7 EUR. If you would like to stay nearby Pod Spálenou trailhead, you may want to choose Chata Zverovka which is located a few minutes from the parking lot. We start our hike at Pod Spálenou parking lot. For a few moments, we walk on an asphalt road on the right to get onto the red trail. In 5 minutes we get to trail fork where we choose the yellow path leading towards Zadná Látaná rest point. We follow a forest path which leads along a mountain stream. In 1 hour the path changes into a dirt trail. Getting from trail fork to Zadná Látaná rest point takes about 2 hours. We continue hiking the yellow trail, which after half an hour enters mountain alp from which we get to admire Western Tatra landscape. Hiking from rest point to Sedlo Zábrať Pass (1656 metres) takes 1.5 hours. The Pass is a perfect place for a picnic - wide, flat and offering great scenery. Getting there from trailhead takes only 3.5 hours, but the view is breathtaking! After we soak in the scenery, we climb down on green trail to Ťatliakova chata mountain hut (1373 metres). The hike takes half an hour. This mountain hostel in Western Tatras is located nearby a beautiful Ťatliakovo pleso lake. One just could not imagine a better place to take a break! It offers 25 beds and 17 extra sleeping places on mattresses. There is a restaurant offering snacks, dinners and refreshments. The dining room is spacious and welcoming, an additional bonus: a fireplace. Ťatliakova chata mountain hut is open in the exact same time as trails in Slovak Tatras - from June 15th to October 30th. The phone number to the mountain hut: +421 0905 973 201. After our well-earned break, we continue walking down on the red trail. In 1 hour we get to trail fork (very close to our parking lot) and change into the green trail. Hiking to the trailhead takes 15 minutes. This option is a 3-day hike. We spend 2 nights in Ťatliakova chata mountain hut (1373 metres) and explore some of the best hiking trails in Slovakia. However, in the second part of the hike, there are chains and exposure points. This part is not suitable for people with a fear of heights. Our first day is nice and easy. It is a very short hike as we spare our strength for the next day. It's also a good option if we travel and only have a few hours to get to the mountain hut. We start our hike in Pod Spálenou car park. We enter green trail and in 15 minutes we get to trail fork where we start climbing red trail. We follow this trail to the mountain hut where we finish our hike and can relax over Ťatliakovo pleso lake. The whole walk lasts about 1.5 hours. This is the most challenging day on our trip. It is a 12-kilometre long hike which lasts about 9 hours. It is one of the most beautiful Tatra National Park trails as we reach two mountain peaks on our way, two mountain passes and breathtaking Tatra lakes - Roháčske plesá. We start hiking on the blue/green trail. After half an hour we reach trail fork Rázcestie v Smutnej doliné (1527 metres). We choose the blue trail and after about we arrive at Smutné sedlo Pass (1963 metres). So far the hike is not very demanding, mountain path ascends mildly and with every step, we get to admire the beautiful Tatra National Park landscape. The real fun begins after about half an hour when we get to Tri Kopy peaks (2154 metres). This part requires experience in high mountains and quite a lot of courage (significant exposure). There are chains to make the hike easier. Here is a video showing the Tri Kopy trail. As we can see on the video, this trail is definitely not OK to hike on a rainy day and is suitable for experienced hikers. Hiking red trail from Smutné sedlo Pass to Baníkov mountain (2178 metres) takes about 2 hours. When we get to the mountain top it is time for our well-earned break. We descend on the red/green trail towards Baníkovské sedlo Pass (2040 metres). After 20 minutes we get to trail fork where we choose the green/yellow trail. Now the path is again nice and easy and we descend towards Roháčske plesá lakes. After about 1 hour we get to another trail fork and choose the green trail. 20 minutes and we see another signpost. We start hiking on the blue trail which soon changes back into the green trail. We are very close to one of the best places to visit in Tatra mountains - Roháčske plesá lakes (1719 metres). For me, this is also one of the best hiking trails in Slovakia. The beauty of those lakes is comparable to famous Valley of the Five Lakes in High Tatras. After we pass Roháčske plesá lakes we arrive at the familiar trail fork and descend the same way to the mountain hut (green/blue trail). Time to get back to our parking. Total hike time: 3.5 hours. We climb down on a different trail to make our trip even more interesting. Hiking green trail to Sedlo Zábrať Pass (1656 metres) takes us about 50 minutes. It is a scenic place, perfect to take good photos. We start walking down on yellow trail towards Zadná Látaná trail fork. In 1 hour the path enters into the forest. We continue hiking the yellow trail. Walk in the forests lasts 1.5 hours. When we get to Zverovka trail fork we are already very close to our car park. We can hike the red or blue trail, but it does not make much difference as both those options are asphalt roads and both lead us to Pod Spálenou parking. → Tatra National Park (called TANAP in Slovakia) is a protected area. TANAP has its headquarters in Tatranská Lomnica mountain resort. → Tatra National Park trails in Poland are dense and it is easier to plan hiking trip. 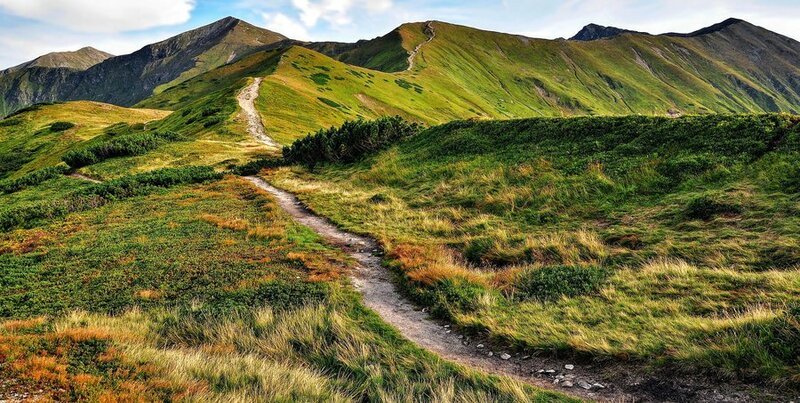 In Slovakia, there are fewer trails. They are also longer, so planning our hike is not so flexible and we cannot change our mind in the middle of the trip. We need to prepare well for our hiking trip. → It is not allowed to hike outside officially marked trails. If we want to hike unofficial paths, we need to have a qualified mountain guide with us. Also, we need to inform TANAP authorities about our plans, give a number of hikers and mountain guide's name. → All peaks above 2500 metres can be climbed only with a qualified TANAP mountain guide. → Tatra National Park trails in Slovakia are closed from November 1st until June 15th. → In wintertime, we can only hike to mountain huts in Slovakia (if there is no avalanche risk). → Entry to Tatra National Park Slovakia is free of charge, but rescue missions are paid. → Tatra mountain rescue in Slovakia is called HZS - Horska Zachranna Sluzba. Emergency number: 18 300. → Trail colors do not indicate difficulty, it is just identification. If you prefer quiet and peaceful villages, then Zuberec or Oravice would be a good choice. Located close to trailheads, both villages are picturesque getaways. If you prefer bigger towns with more attractions in the area, you might want to stay in Liptovský Mikuláš. The biggest attraction in this town is the famous Tatralandia waterpark. Water sports enthusiasts will enjoy a day spent on nearby Liptovská Mara lake. → Štrbské pleso and Popradské pleso - fast and easy option, suitable for families with children. → Bystrá lávka in High Tatras - great circular hike close to Štrbské Pleso mountain resort. Amazing landscape, but might be dangerous on a rainy day. One of the most exciting hiking trails in High Tatras. → Kriváň mount in High Tatras - Slovak National mount. Quite demanding hike, but the view from the mountain top rewards well the effort. One of the most popular hiking trails in High Tatras in Slovakia. Meander Thermal Park in Oravice. Nice, but rather small compared with other Slovak waterparks. The advantage is that it is not crowded. Only one water slide available. Indoor and outdoor hot thermal pools. Located right at the foot of ski slope - there is an option to combine waterpark ticket with mountain lift ride. The biggest and most popular waterpark in Slovakia. There are many slides, thermal pools and other water attractions, but it is immensely popular among tourists. It might be a good idea to visit Tatralandia in the morning or evening to avoid crowds. Aquapark Gino Paradise in Bešeňová. Also big and modern waterpark, but a bit less popular than Tatralandia. It is my favourite one out of these three waterparks. Another great place to relax after a day spent hiking trails is Liptovská Mara lake. Tourist infrastructure is well-developed in this area. Beachgoers can relax on the sand, water sports enthusiasts can rent sports gear and try yachting or windsurfing. On Liptovská Mara lake are also organized tourist ship cruises. There is Mara Camping in Liptovský Trnovec village.